Thinking of unique ways to market your architecture has become a staple in many firms as a way to attract awesome clients, get your projects seen and improve your referrals. The key to having a successful marketing strategy at your firm is encouraging conversion by offering value. So make your initiatives fun, try new ideas and see what your audience values the most. Below is a list of 68 architect marketing ideas that you can easily implement at your office to get clients. A lot of the architectural marketing ideas listed here are ones we’ve used ourselves and have seen the benefits firsthand. Many others were put into practice by awesome firms that know how to grow their business. Whether you’re a sole-practitioner or the largest architecture firm in your city, there’s bound to be something here that will fit for your firm. If your website isn’t built to collect email addresses for your mailing list (the polite way of saying nobody wants your newsletter), then add a Sumo plugin. It takes less than five minutes to setup and will add an attention grabbing email signup form to the top of your website. You can also point it to your contact page and people will actually go there. Adding quotes and testimonials from real clients to your homepage and project-specific quotes to each project page is a surefire ways to get more leads. Make sure the quote is believable (don’t quote your mum), and try to use quotes that focus on unique aspects of your service like the office mini-fridge and unpaid overtime. The area of your website that a visitor sees first when they arrive on your homepage is your most valuable real estate. If you decide to fill it with a hero shot from your latest project, then it should be overlaid with text that sells your firm and an irresistible (we use a spunky pink #ff0054, if you’re wondering) contact button. Your homepage ‘offer’ should be appealing to your visitors, otherwise they will go looks at memes. Is your website more interesting than memes? The offer is your service, and if the benefit of the offer isn’t totally clear, try adding some explanation of the benefits of working with you or at least contacting you. Reduce the number of options your visitors have on any given page so that more of them will do the most important thing, whatever that is. If your website is meant to drive people towards emailing or calling you, then overwhelming them with less-valuable choices “check out the office space we designed in 1997!” will divert visitors away from the main goal. After your visitors fill out a form or sign up to your mailing list, you should redirect them to your calendar so that they can book time to speak to you. Try an app called Calendly, which syncs with your Google Calendar availability. This will improve your conversion rate and reduce your time wasted following up. We all know that if you’re targeting everyone, you’re targeting no one. With that in mind, one option is to tell your visitors exactly who your firm is for, whether that’s real-estate speculators looking to make a fast buck, or parents who realise their kids won’t move out until they’re deep into their thirties. While you’ll immediately disqualify a segment of your potential clients, you will create a closer connection with visitors who fall into your category. Remove those fancy sliding image galleries, particularly on your homepage. They might seem fun, but they hurt your conversion because they slow your site down and push your content below the fold. They also tend to annoy visitors on mobile devices. Instead, focus on reducing the quantity of images you’re presenting so that visitors only see truly important content in the precious 60 seconds you have their attention. If someone joins your mailing list, what happens next? They get a newsletter in four months when they’ve already moved on. 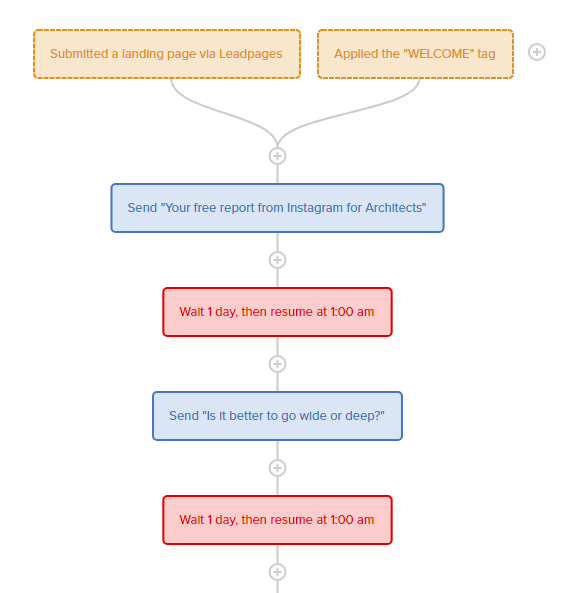 Use Drip to create an automated email sequence that will be sent to all new email signups. Start with an introductory welcome email, and follow up with the best articles and projects your firm has created. Each email will have a primary goal of booking a meeting. Hustle! 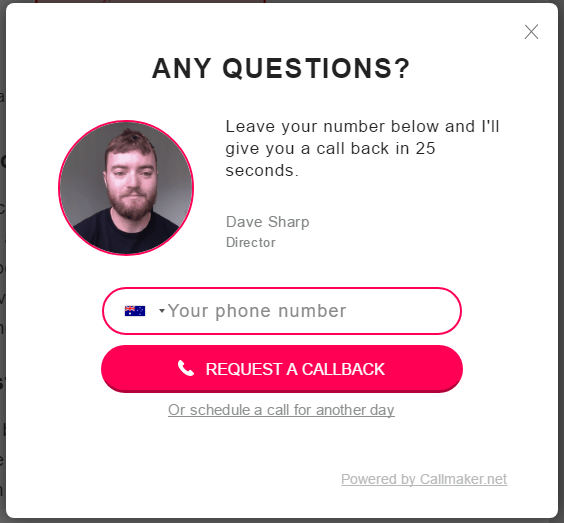 Phone calls convert much better than email, so by embedding Callmaker on your site, your visitors will be able to request an immediate call back. When a visitor enters their phone number, Callmaker will call you and the prospect then connect you to each other. You can set your available hours in Callmaker, and it will prompt the visitor to schedule a call for another day if you aren’t available at the time. It’s total blind dating, but the awkwardness of the whole thing will bring you closer together if you persevere. Having a hard time with blog content? Interview a past or current client. Record a phone interview and use a transcription service such as Rev to turn it into a conversational blog post. With a bit of editing, you’ll have a highly converting piece of content to share on your website. Your visitors will think “wow, this person seems happy, I want to be happy too!”. Put your newsletter signup link in your email signature to capture new leads. Those mysterious CC’s and BCC’s deserve a way into your world. Your inbox is a massive source of leads that you should be adding to your mailing list. You can follow this tutorial to scrape the emails from your inbox, then use Zapier to import all future emails into your preferred newsletter software automatically. Nobody can escape the scrape. Ask other architects and designers to provide sycophantic quotes about your firm to demonstrate that your firm is highly regarded in the industry. It’s one thing to say that you’re an industry leading firm (who doesn’t), it’s another to present testimonials from other architects backing that up. If you’re targeting clients that haven’t worked with an architect before, then you should write a detailed beginner’s guide to the design process. Discuss the benefits of working with an architect, the steps involved and some insight into what’s unique about your process. Once you’ve created this page, make it stand out by adding a prominent “START HERE” button to your primary navigation bar. You have no idea how scared and confused your website visitors are, the poor things. If you have awards, publications or industry affiliations then give these logos prominence to improve conversion. Amos Goldreich Architecture put their awards front and center on the home page. You should always ask your followers to visit your website. When you post a photo of a project, update your Instagram bio URL to point to the corresponding project page. No more 500 word Instagram captions, thank god! The fans of other architects in your niche could easily become your clients. They’re just waiting for you to pounce. Follow the people who are liking your competitor’s photos and like their photos. Unfollow them after a few days and repeat. Instagram is actually this easy. Instagram allows up to 30 hashtags on each post, so use as many as you can. Don’t use a hashtag without checking that a lot of people are already posting to the hashtag you have in mind. #whatsinthetradieslunchbox isn’t a real hashtag, buddy. Few people use the Linkedin articles feature, so anything you post will get a lot of traffic. Take the images and copy from one of your recent projects and turn them into an article on Linkedin. Be sure to link back to your website throughout the article. Your Linkedin network may just be other architects, but maybe those architects have real life friends. Network effect! Consistency is key on Instagram. You should be posting at least once a day, which can be a lot of hassle, so use Buffer to plan out a month of posts ahead of time. That way, you can forget about Instagram for a month — or delegate it to the work experience kid. Social media shouldn’t be your job, architect. 22. 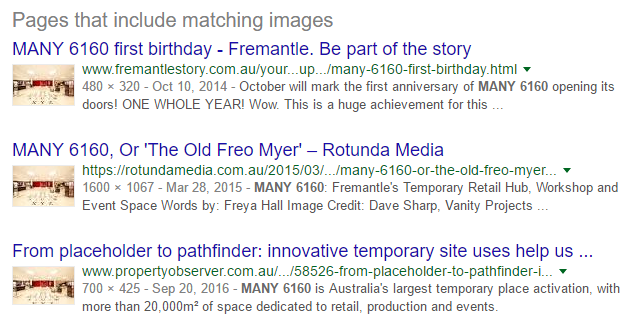 Use Reverse Image Search To Find Blogs Who Have Used (Hijacked) Your Images. Ask For A Link. By reaching out to websites that had used my photos of MANY 6160, I got 20 new backlinks. Instagram’s algorithm only allows a small percentage of your followers to see your Instagram posts, so if an image does well, schedule it to post again in 30–60 days. Since very few website visitors look at your older projects, these images are also going to waste. Include them in your Buffer queue to extend their shelf life. That addition you did in 2003 can still make you money! When you have a new project that you would like to beat journalists over the head with, create a tight media kit that tells the writer everything they need to know about the project to save them time. Journalists are lazy, so make their job easier. You can use Bowerbird to make the outreach part easier for yourself, too. Now everyone is chilling. If you frequently share articles on your website or social media, you can use Snip.ly to drive traffic back to your website. It will add an attention grabbing banner to the page you’ve linked to that points back to your website or one of your recent projects. Adding a Drift live chat widget to your website will improve conversions, collect more email leads and allow you to answer questions in real time. You should invite your whole team so that your visitors can get a response even when you’re busy. 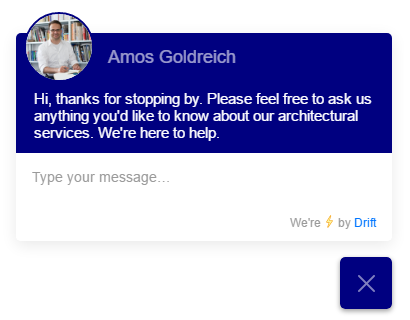 Amos Goldreich Architecture use live chat to drive leads. This will make you more approachable and will improve your chances of turning social media fans into clients as you demonstrate your expertise in a cool showbiz way. More importantly, you can get on the offence and follow up with stream attendees afterwards to set up a meeting. You can also chop the video up and make a best-of video for your website. If you can’t create original content for your email list every week, then consider curating articles that your audience will find interesting. A tool like Revue makes it easy to collect articles and send them to your audience. No original thinking required. Site visits are usually the worst photography any architect can share — they’re just challenging. How do you see the interesting bits amongst the ciggy butts and ice-coffee cartons? Hire a photographer for site visits to important projects. For a small investment, you’ll have dozens of great images to drip out over time that will help your prospects to understand how hands on your role is. Journalists also look at progress shots when deciding whether or not they should reach out to you to get the scoop, so selling your work while it’s under construction can help to get that process started early. We all know how important it is to use hashtags, but few remember to tag a location. Location search is another way for clients in your area to find your photos, so be sure to add your city to each post. We can all be influencers within a 50m radius of our office. Your Instagram followers follow hundreds of other brands, reducing the chance of them seeing your latest image to almost zero. By posting every day, they will see your photos more frequently — perhaps once every 10 days rather than every 10 weeks. Each post will also reach people outside of your account and will help to attract new followers and brand awareness. Interviewing a popular designer in your niche and publishing the transcript on your blog allows you to capitalise on their brand awareness and social media influence in order to build your own. You’ll also turn up in google searches for their office, which is even sneakier. Google loves Quora, so writing detailed responses to popular architecture questions on this thriving Q&A platform will demonstrate your expertise and help you to reach an enormous audience of prospective clients. Quora is a great alternative to writing your own blog, because the topics are provided and traffic is guaranteed. Make sure to give thorough responses, 2000 words or more with links, data and images if possible. Lazy answers are a waste of time on Quora. If you don’t have the time to write a blog post, then one alternative is to record meetings or phone calls and have them transcribed. You’ll have plenty of educational content to extract, and the tone will be informative and conversational. Following on from a previous idea, you can build your reach on social media by interviewing a group of other designers. A great way to approach this is to ask several contacts the same question and turn their responses into a round-up post that examines the issue from multiple angles. Not only will the designers share your post to their audiences, but being seen as a connector and leader in your niche will improve conversion. Again, you’ll be stealing their google traffic too. Podcasts are hugely popular, and totally under-exploited by designers. Podcast hosts are desperate for guests, so by searching the new & noteworthy design category on iTunes, you will find a handful of shows who would love to have you on. Just send them a cold email, pitch your story and suggest a Skype interview. Practice your radio voice. HARO is a free email newsletter that connects journalists with expert sources from various industries. After you subscribe to HARO, you will receive call-outs for experts three times per day. You will find several journalists looking for design experts every week. They usually ask for opinions on stupid things like “cushion trends”, but we’re talking New York Times, The Financial Review and so on — so you should stoop a bit. If Grand Designs taught us anything, it’s that the public loves the format of site visits — scary moments, anticipation, unseasonably wet weather and big dreams torn to pieces. Use your phone to film a vlog update on your projects each day and post it to Facebook and Youtube. Include your clients and tradies where possible for local colour. A great way to find a blog topic that people are interested in is to use Buzzsumo to find out what is trending in architecture — then write your own article on the same topic from your own unique perspective. To give the article a traffic boost, search for the original article on twitter then reach out to the people who shared it — they’ll most likely share yours as well. Copycats always do well on social media. Young people are great at Instagram, they’re also way more connected than you realise and as we know, they’ll do anything for free. Invite students on site visits and run a photo competition, it will give you a stock of high quality images that you can use on your own account — as well as exposure to their family and friends. First prize is an unpaid 24-month internship. If journalists are quoting your competitors, Google knows about it. By setting a news alert, you’ll be able to pick up these articles quickly and reach out to the writer with your own take on the issue — which they may include in the original article or improve your chances of featuring in a future piece of content. This works especially well if your competitor is boring and you’re edgy. This is both an SEO and user experience tip — it’s important for Google and your visitors to know what you do and where you are as soon as possible. Otherwise, they’ll get confused and leave your website. It sounds obvious, but good luck finding an architecture website that tells you what they do. Experiment with your button copy, it can make a massive difference to your conversion rate. We’ve found that “Talk to an architect” or “start your project” both have significantly higher click-rates than Contact Us. Little known fact, adding an “>” after button text improves conversion. Nobody knows why. Thousands of residential architects are on Houzz, but few put in the time to solicit reviews from their clients. If you sort a Houzz search result page by ‘most reviewed’ as many do, you can usually rank on the first page by having as few as 20 positive reviews. 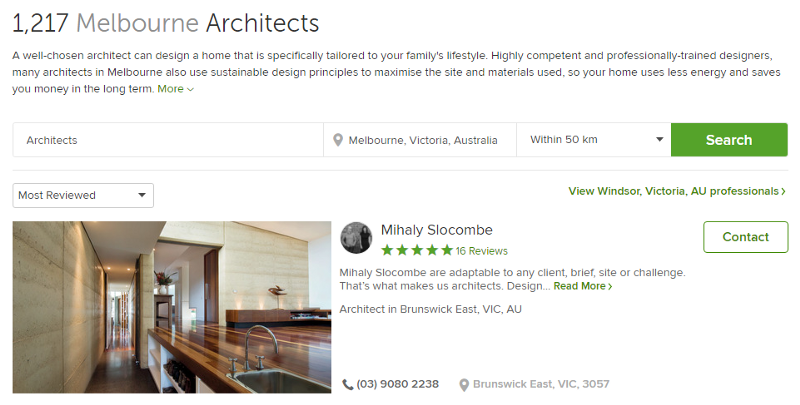 Mihaly Slocombe, the most reviewed architect in Melbourne, has just 16 positive reviews. Do you have a hard time explaining your service in a simple way that everyone can understand? Interview your past or current clients about what you’ve done for them then use their language as the foundation for your website copy. They’ll use words like nice, pretty and fun. Those are good words. Sometimes new leads go gold, so use If No Reply to send them an automated sequence of emails that will only be sent if they don’t reply. Keep sending these until they fold like the cheap suit and hire you. Scarcity improves conversion — if you are really busy and only looking to consider a handful of clients with great briefs, you should mention that on your website. Even if you’re not, try to create scarcity (#fakescarcity) wherever you can. Aside from linking to content on your website in your newsletter, you should also link to your website contact form with a similar call-to-action button as used on your site. Although leads can reply to your newsletter, they may not realise it or feel motivated to take this action without an attention grabbing button. People need to be told to do things. Testimonials are great, but ones that come from social media are even better (because social is the only game in town). If someone tweets a positive message about you or your work, embed it on your homepage for extra social authority and improved conversion. You can be specific or vague when defining the THEM, however this type of content makes the superiority of your service clear for your visitors. The divisive-dollar is a hot dollar in 2017. In addition to having a publication page, embed the logos of popular publications on your homepage to improve your conversion. 55. Do An Invite-Only Open-House Of Each New Project For Your Mailing List. Open houses are killer business development opportunities for architects because they allow your prospects to experience your spaces directly and meet you in person. Remember, photos of buildings aren’t buildings. Take advantage of this rare opportunity by creating a private Eventbrite and invite the members of your mailing list to an exclusive preview. Give them free stuff like party pies and company swag. Don’t hide your pricing. It is very difficult to find out information about what architects charge anywhere on the internet. It’s unfair on your prospects, and yourself, to keep this information a secret. We all know that good design doesn’t have to be more expensive, so make the case for that with a pricing page that explains how architect fees work. You can improve word of mouth by cold-calling past clients to check-in on a quarterly basis. You never know what can happen when you get on the offense to drive referrals from past clients. They may be thinking of a second home, or have a friend who was asking about your work. I worked for an office in Japan that did scheduled maintenance check-ups on the building to see how it was holding up as a way of hard-selling an addition or holiday home. Asking for a project budget will help you to pre-qualify bad leads, and will also allow you to anchor budget expectations so that leads know you can work with them. Bids start at 2mil, ladies and gentleman. Pushcrew will ask new visitors to your website to approve browser notifications, which are short messages and links (like tweets) than you can send to your audience instantly no matter where they are on the internet. These have a huge click-rate, and can be even better than email for driving traffic to your website when you have something important to promote. Your visitor doesn’t need to see dozens of projects right away to understand that you’ve done a lot of work. Pick your best project from each category and make them the focus on your landing page. Other projects can sit somewhere on the website, but don’t put them on your home page. Less is more! Instead of filling your homepage with images, just say “aside from these three beauties, we’ve also designed 54 buildings that were just as awesome” — who is going to bother fact-checking that. Use Sumo to trigger a PDF download in exchange for an email address. The best piece of content to promote is a single-page checklist or guide for people thinking about building in your local area. Use client-generated content wherever possible. Even an iPhone-recorded tour of their new house (fun and exciting) will be a shaky, awkward and engaging addition to that project’s page. Meetups are a great way to generate relevant leads. Create a recurring monthly event at a local cafe or bar and promote it in your local area targeting anyone who is thinking of building. Facebook ads are a great way to promote this event, but it will work even better if you just target your mailing list. As a professional, you have access to many time-saving calculators and spreadsheets that take the guesswork out of the construction process. Potential clients would do anything to get their hands on simplified and user-friendly versions of these, so put one together and offer it in exchange for an email on your website. Blow them away with your fancy skills. Go into your Instagram settings and turn your account into a business account — you’ll get a contact button that makes it easy for your followers to email you without leaving the app. Your business account also includes advanced social media analytics that will tell you which posts are winners and which are universally hates so that you can up your game. Viral giveaways are wholesome cheesy fun, but most importantly, they give those who invite their friends a much higher chance of winning. This way, you’ll expand your email list really fast. We’ve used Maitre to run a wildly successful giveaway that added 442 people to our list directly from our other social media platforms, then an additional 1211 who were invited by the initial 442. The prize should be specific to people who are interested in homes and good design, so I’d recommend a nice piece of designer furniture or tapwear. If you use a product whose designer has 15'000 followers or more, then ask them to share it with their fans. 67. Order a Peek test to find the sticking points. It’s hard to know what’s letting your website down and confusing your visitors, so order a free user test to find out what’s turning clients away. You can read a step-by-step guide here. 68. Record heatmaps to find out the important parts of your website. When trying to make your website more usable, use a heatmap tool like Hotjar (which is free) to record a useful heatmap. Remove the dead weight, the stuff that your visitors wouldn’t touch with a ten-foot-pole, and you’ll find your conversion will start to improve pretty quickly. That’s it for now! We’ll update this post from time-to-time and make it more awesome. If you have a great idea that we’re missing, please leave it in the comments below and we’ll give you props in the article. As always, if you want help implementing ideas like these for your office, get in touch with us.